Ahead of today's sole practice session, the air temperature is 24 degrees C, while the track temperature is 34.3 degrees. Following yesterday's overcast conditions, today it is brighter and warmer. Nonetheless, there is a 20% chance of rain. While Max Verstappen was quickest in yesterday's opening session, Valtteri Bottas set the pace in FP2. Interestingly, in the first session the top three were covered by just 0.096 while in the second the gap between the top two was 0.003s. While there were plenty of lock-ups yesterday and a number of excursions, only one driver came to grief, Nico Hulkenberg crashing heavily in the second session. In FP1, it was noticeable that both Renault drivers were running wide exiting T15 and eventually Hulkenberg pushed his luck just a little too far, getting two wheels on to the damp grass and heading off into the barriers. Currently two drivers have grid penalties, Daniel Ricciardo drops 5 places after taking on a new turbocharger, while Esteban Ocon also drops 5 after his team changed his gearbox. 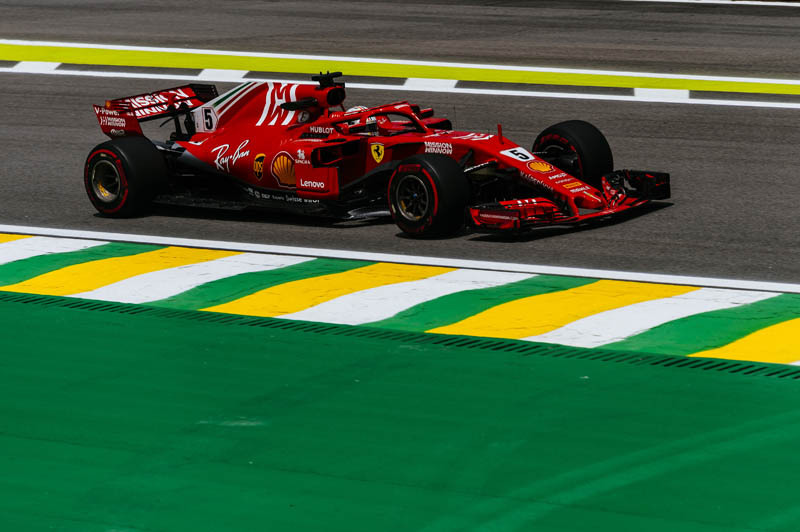 Overall, and based on the race simulations, Mercedes and Ferrari are close, but it remains to be seen how the tyres stand up, Vettel setting a strong pace but suffering blistering in the cooler temperatures. Mercedes also had blistering issues while Red Bull seemed unaffected. Tyres this weekend are medium, soft and supersoft, though the white-banded mediums have only been tried by a couple of drivers. Brendon Hartley celebrates his 29th birthday today, and what better present than to be given the spec-3 Honda unit. Teammate Pierre Gasly, also getting the latest unit. The pitlane opens and Leclerc leads the way, followed by Ericsson, Gasly, Grosjean and Hartley. A mixture of softs and supers. Five minutes in, Raikkonen is the first of the big guns to head out, followed by Sirotkin. Unlike their predecessors, both remain out for a second lap. Raikkonen posts a 9.424 to get things underway, Sirotkin stopping the clock at 11.169. The Finn is on supers while the Russian is on softs. On board with Stroll and the Williams is a clearly a real handful as he struggles through the Esses. 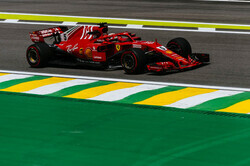 The Canadian subsequently posts 24.603, while Raikkonen improves to 9.409. Twelve minutes in and Raikkonen pits, leaving Stroll alone on track. Thus far only ten drivers have been out. That said, Sainz and Vettel head out, the Spaniard on softs and the German on supers. Leclerc subsequently joins them. Quickest in all three sectors, Vettel goes quickest with an 8.857, 0.552s clear of his teammate. Hamilton clearly has an issue, already driving slowly he is told to return to the pits at "normal pace". Back in his garage, the engine cover is quickly removed... with a noticeable amount of smoke. Hulkenberg reveals that his steering is much heavier when turning to the right. Meanwhile, Bottas goes third (9.534), ahead of Leclerc, Hulkenberg, Gasly and Ericsson. While engineers swarms over the rear of Hamilton's car, teammate Bottas splits the Ferraris with a 9.310. As smoke continues to rise from the rear of Hamilton's car, a number of crew members form a wall to block the view. Grosjean goes fifth ahead of teammate Magnussen, as Haas continues to look strong following yesterday's similar performances. Though Hamilton is the centre of TV camera attention, it's worth noting that 27 minutes into the session the Bulls have yet to appear, while Vandoorne is the only other driver still to post a time. On the half-hour, Hamilton heads out, panic over. Mercedes revealing that the issue was a breather pipe that was dislodged. "Made a bit of a mess middle sector, lost a bit of traction," reports Hartley, having gone twelfth with a 10.248. Going quickest in S2, Hamilton crosses the line at 9.098 to go second, 0.241s down on Vettel. The Bulls finally head out, and benefiting from a tow from Vandoorne, Ricciardo goes fourth with a 9.236 while Verstappen subsequently posts 9.405 to go fifth. On fresh supers, Raikkonen goes quickest in S1 as Hamilton hoes quickest overall (8.762). The Finn makes a mistake in S2 but a strong final sector sees the Austin winner cross the line at 8.490. Vettel goes quickest in the first two sectors, as Hamilton encounters traffic. Vettel crosses the liner at 7.948. Bottas responds with PBs in all three sectors to post 8.465, albeit 0.512s down on the Ferrari. Shortly after Vandoorne wonders whether he hit a bird, a photographer almost suffers a similar fate in the pitlane as he is pulled out of the past of Perez. Gasly enquires which of the Red Bulls has stopped on track having seen it on one of the giant TV screens. He's informed that it's a replay of Ricciardo's retirement in Mexico. Verstappen reports that his car isn't turning "entry to mid-corner", when asked if this is both sides, he replies "everywhere". A PB for Hamilton in S1, the Briton subsequently going quickest in S2. At the line he posts 8.165 to go second, 0.217s down on Vettel but 0.300s up on his teammate. "We haven't seen a great second lap on these tyres," Hamilton is told, "but let's go for it." Meanwhile, Leclerc posts 9.655 to go best of the rest, only to lose out when Grosjean improves to sixth with a 9.257, ahead of Verstappen. A poor final sector means Leclerc can only manage 9.448, but as Magnussen posts 9.146 to go fifth, this means the Monegasque is only 9th. PBs in all three sectors sees Ricciardo demote Magnussen for fifth. "Do we have time for time for a drive-through," asks Hamilton, and he doesn't mean McDonalds or KFC. A tow from Sainz help Verstappen (8.733) to improve to fifth, but the Bulls remains 0.7s off the pace. A late improvement for Hulkenberg sees the German go eleventh (9.461). "The tyres are cold at the front," reports Verstappen, "a lot of understeer still." Both McLarens well off the pace, as is Perez, while, not for the first time, Hartley is seriously out-paced by his teammate. The Mexican is unhappy at being sent out in traffic. "Cool the brakes, cool the brakes, quick," warns Vettel as his car is pushed into its garage. "**** he blocked me, what the hell?" moans Gasly. Vettel is quickest, ahead of Hamilton, Bottas, Raikkonen, Verstappen, Ricciardo, Magnussen, Grosjean, Gasly and Leclerc. Hulkenberg is eleventh, ahead of Ocon, Ericsson, Sainz, Sirotkin, Hartley, Stroll, Alonso, Perez and Vandoorne.